It comes with feed level adjustment which Avoids feed wastage during early rearing period. Grill provided ensures minimum feed wastage which in turn increases profitability. We offer a ‘Feed Controller Slider which enables farmer to shut-off feed where there are no birds. Automatic water drinker for day old chicken, water supply is fully automatic, no need to refill cups, no water spillage from cups. Water from tank can be easily channeled to cups by reducing pressure. Human labour can be reduced to large extent. Very easy to clean. This is a perfect system for deep litter system. 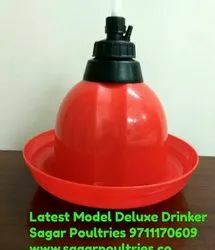 Matching up to the years of understanding of this domain, we provide the handpicked quality of Automatic Drinker. The best grade of materials is used for manufacturing of the products as per the industry laid norms. A system exclusively for Classic Broiler Drinker and Layer growers with minimum components, food graded rubber in a float design and a small bowl having a high degree technology which ensures fresh and hygienic water round the clock. We offer Poultry Drinkers for a day old chicks with a capacity of 2.8 litres. These drinkers are recommended as 20 drinkers for 1000 chicks. A day old chicks find it easier to drink water from these drinkers. The water level can be observed as the drinker is translucent and thus is easy to clean after use.